Organizations that process payments for goods and services may appreciate AngelPay's reliability, transparency, simplicity, and nonprofit cost structure. Select the option above that most closely matches your needs. Calculate your savings and analyze detailed cost comparison data to see how AngelPay compares to for-profit service providers. Generous Rewards. No Nonsense. Simple & Transparent. Get paid cash for referrals and your artistic talent. See if our Emergency Contract Triage Program can heal the pain caused by your existing service provider. Saving our Members' time and money is our purpose and Mission. Every AngelPay Affiliate begins by learning the simple elements in the Rewards Program table below. Click the links or icons in the table to reveal a brief description of each level. Cant’s see the whole table? Try the mobile version. Current or prospective Affiliates may use the Calculator below to estimate your affiliate income. One of the Most Important Missions of Our Time. It’s important to always remember that the AngelPay Foundation is a nonprofit payment processing and economic development platform with an important mission. That means we help everybody in the AngelPay Community to keep as much of their hard-earned money as possible, which we believe is one of the most important, socially conscious missions in today’s unstable global economy. AngelPay Shares the Wealth. In contrast to other payment processors, AngelPay keeps a much smaller fraction of all the funds processed through our nonprofit payment processing platform. The only reason we keep any funds at all is to cover AngelPay’s infrastructure costs, reasonable staff salaries, and the financial rewards to our Affiliates. Improving the Quality of Life in Our Communities. Working together, we can improve the profitability and quality of life for many organizations and people in virtually every community. To accomplish this, AngelPay provides the technical tools, financial opportunities, decades of industry experience, training and education, and positively aligned incentives throughout the AngelPay Ecosystem; you provide your enthusiasm and networking talents. Together, we can create one of the most fun, fair, transparent, and rewarding communities in human history. The following guidelines are intended to help prospective AngelPay Affiliates understand all the features of the AngelPay Rewards Program. 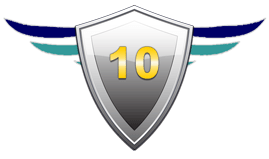 Levels: These are descriptive, fun, and memorable phrases that help our staff and our Affiliates recognize and appreciate what level each Affiliate has achieved within the Program. Affiliates graduate from “Novice Angel” to “Guardian Angel” one level at a time as they grow their AngelPay Member Networks and achieve the required milestones that correspond with each level. Achievements: As an Affiliate, there are only two basic factors (“Required Milestone Factors”) that determine your Program rewards: (1) the number of Members who join because of you; and (2) the total monthly payment volume that those Members process through the nonprofit AngelPay payment processing platform. In the Rewards Program table (under the “Overview” tab), there is an “Achievements” column, which contains two sub-columns. Let’s take a closer look at these two columns. “Min # Members”: This column displays the numerical range of Members that Affiliates must help to join the AngelPay Community before the Affiliate can graduate to the next level in the Program. Prospective Members introduced to AngelPay become official Members after they start processing their payments through the AngelPay payment processing platform and pay the appropriate membership dues. All the Members that you introduce to AngelPay can be perceived as your personal “AngelPay Member Network”. Thus, the level you achieve depends on the size of your personal Member Network and the Minimum Monthly Volume of your Member Network, which we discuss next. 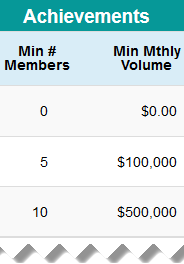 “Min Mthly Volume”: This column displays the amount of total monthly payments that AngelPay has processed for your Member Network. For example, if you have 10 Members in your Network and they are collectively processing $1 million per month, then $1 million is the total monthly payment volume attributed to your Member Network. In this case, 10 Members and $1 million in total monthly volume is within the “Star” Rewards Level. Now let’s say you have introduced 90 Members and all those Members are collectively processing at least $50 million per month with AngelPay. In this case, $50 million per month is associated to you, which means you have graduated to the “Superhero” Level and are receiving the corresponding Superhero rewards. Guidance Columns: These two columns are provided as a courtesy to help Affiliates understand two basic concepts: (1) The average monthly processing volume per Member for each Program level; and (2) the rewards associated to each level. Let’s look at each of these concepts more closely. the typical size of the Member Network that enables most successful Affiliates to achieve each corresponding Program level. “Reward Rate”: The Reward Rate is an incremental (technically called “marginal”; see below) percentage rate that corresponds to the monthly cash rewards that each Affiliate receives for helping their Members join the nonprofit AngelPay Foundation. For example, Affiliates that achieve the Guardian level receive 47% of all the Membership Dues that the AngelPay Foundation receives from their Members. Each Affiliate’s cash rewards continue being distributed to the Affiliate every month for the life of their Members’ membership with the AngelPay Foundation. Marginal Reward Rate Explained: Anybody who has ever paid income taxes should be familiar with the concept of a “marginal rate”. In this case, instead of being taxed, Affiliates are paid a cash reward at a marginal rate. To avoid any confusion, it is important to understand that the Reward Rate is a marginal rate that corresponds with each Program level achieved. For example, if your Required Milestone Factors performance is within the Epic Level (between 45 to 60 Members and at least $5 million in monthly processing volume), then your top marginal Reward Rate is 35%. However, because the Epic Level is the sixth level, you will be paid for levels 1-5 at the marginal rate that corresponds with each of those levels, too. In other words, you will be paid at six different rates for each group of Members that corresponds to each level. Of course, this entire process is fully automated for you, so you don’t need to do the math unless you really want to. You can use the Rewards Calculator any time to estimate your rewards at each level. Additionally, every Affiliate has secure access to their own AngelPay Affiliate Center, which provides detailed statistics about their Rewards and their Member Network performance. 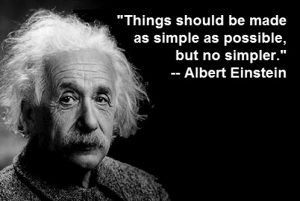 Everything Should be as Simple as Possible, but No Simpler. We agree with Einstein and we realize the incremental (“marginal”) Reward Rate is more complicated than having only one rate, but that would create an unsustainable drain on the AngelPay Foundation’s resources, which would compromise the quality of the service we provide to our Members. We like simplicity, which is why we’ve simplified every other aspect of the payment processing and Rewards Program experience for our Members and Affiliates, but some things in life require a certain measure of complexity to preserve their sustainability. The AngelPay Rewards Program is still the most generous, sustainable affiliate program that we’ve seen in any industry and we do everything possible to help our Affiliates to be as successful as possible within the scope and limitations of our nonprofit mandate. IMPORTANT: To graduate to each level, Affiliates must successfully achieve both Required Milestone Factors corresponding to each level. Achieving the minimum number of Network Members without achieving the Minimum Total Monthly Volume (or vice-versa) is not sufficient. © 2019 The AngelPay Foundation. All rights reserved. The AngelPay Foundation is a nonprofit (501c3) organization and a registered ISO and MSP of Esquire Bank in New York. You will never receive spam from the AngelPay Foundation. Your personal information is never shared with third-parties without your explicit permission. Enter the fixed monthly fee that Processor X charges you. Note: Most processors don’t include all their one-time and incidental fees in their rates. That’s why we give you the ability to include all the fees below to more accurately calculate Processor X’s true cost. 1. This is when our team founded and launched Authorize.net. 2. This is when our team founded and launched Authorize.net. 3. PCI fee is a mthly “PCI Non-Compliance” fee. 4. Acquired by PayPal in 2013. 5. Amazon was founded in 1994, but their payments service was launched in 2007. 6. First Data usually only works through resellers unless you’re a large company. 9. $99/year PCI fee converted to mnthly rate. 10. $79/year PCI fee converted to mnthly rate. 11. Mthly fee adds recurring billing & fraud protection. 15. $75.20/year PCI fee converted to mnthly rate. 16. Many acquisitions make it difficult to identify first online payment processing year. 17. 3-yr contract. TSYS has existed for many years, but online processing since ~2000. Enter the average $ processing volume that you process each month. Choose between Fixed Monthly Dues or Variable Dues. Fixed Dues provide a guaranteed and predictable low monthly cost. Variable Dues is the same as the more technical term “Interchange-plus,” which may be preferable for some organizations. Enter the average number of transactions that you process each month. As a Member of the nonprofit AngelPay Foundation, this would be your guaranteed monthly dues cost based on the parameters you have configured above. No hidden fees. No surprises. Note: The membership dues do not include the Interchange Fee charged by the credit card networks (Visa, MasterCard, American Express, Discover), which all payment processors must charge equally for each type of transaction. AngelPay does not add any markup to the Interchange Fee; so this is simply a pass-through cost from the card networks to our Members. To see the total cost of your monthly processing, please see the “All-In Cost” comparison at the bottom of the Calculator after you have finished entering all the applicable cost items below for your particular situation. As a Member of the nonprofit AngelPay Foundation, this would be your estimated processing cost per transaction. No hidden fees. No surprises. (Note: The membership dues do not include the Interchange Fee charged by the card networks. Please see the “All-In Cost” for the all-in cost of your monthly processing. Select the average tiered rate (including Interchange) that Processor X charges you for their services per transaction. Select Processor X’s average Interchange Fee. If you don’t know it, use the default value of 1.70%, which is common for most organizations. Note: Most processors don’t include all their one-time and incidental fees in their rates. That’s why we give you the ability to include all the fees below to more accurately calculate Processor X’s true cost. Also Note: Interchange is not a “markup”—it is essentially a tax imposed by the card networks—so Interchange is only included in the “All-In Cost” calculations at the bottom of this Calculator. Enter Processor X’s per-incident chargeback fee. AngelPay’s Chargeback Fee passed through to our Members. We wish we didn’t have to charge anything at all, but this is the actual cost for each incident. We only ask to be reimbursed for our costs. That page will be available soon. This link will be updated as soon as that page is ready. Thank you for your patience. This is the amount of fees that a payment processor adds on top of the Interchange fees calculated as a percentage of your total processing volume. This is the total cost per transaction (“All-In”), including Interchange Fees and all other added processor fees. This helps to prevent payment processors from manipulating their fee language to claim they are a better choice. This is how much cost a payment processor adds on top of the Interchange fees on an annual basis. For each Cost Item category, the numbers in this column represent the mathematical percentage and financial cost difference between AngelPay and Processor X.
Novice Angels study the materials on this website so they can understand why the AngelPay Mission is so important to their community and the broader economy. Then they will learn how to effectively communicate exactly why AngelPay is important to organizations that need reliable, low-cost payment processing and guidance on how to navigate the pitfalls of the merchant services industry. With a little patience and persistence, the rewards can add up quickly. Apprentice Angels start to spread their wings and see the fruits of their labor. Executive Angels feel confident in their abilities and map out a game plan for long-term success. Superhero Angels are destined for greatness in whatever they set their minds to do. Their success with AngelPay is just the beginning. They will fly high above most other mortals for the rest of their lives, but they will always remain humble and they will seek to use their super strengths to strengthen others as often as possible. This is the monthly USD value of all the transactions that AngelPay processes for the Members that come from your Member Network. Enter the estimated average monthly payment processing volume for the Members that you intend to introduce to AngelPay. For example, if you intend to introduce 10 Members and you think they collectively process approximately $1 million per month, then you would enter $100,000 because that is the average processing volume for all 10 Members ($1MM / 10 = $100K). Make sure you use the average monthly volume on an individual Member basis, (not a collective basis); otherwise, these estimates will be too high. Enter the number of Members that you intend to introduce to AngelPay. Star Angels begin to organize their time and resources like a small business, developing efficient processes to expand their networks and their rewards. Hero Angels have earned enough to be comfortable financially. Now they can stop worrying about existential survival and start thinking about how they will give back to their local communities; although some may continue building the AngelPay Community, too. Epic Angels are epic networkers and community builders. They have mastered the artform of flying high without losing their perspective of what is most important in this world. Legendary Angels are living legends. These people can do anything they put their minds to. We are fortunate to have their talents and energies focused on building the AngelPay Community. Mighty Angels are extraordinary human beings on every level. To achieve this degree of success, they have invested heavily in their own personal development, their lives have become beacons of hope to others, and they inspire others to work toward their full potential wherever they go. Guardian Angels see the world differently. With all the money and security they will likely ever need, they are free to explore the world in all its glorious diversity and mystery. They see a planet full of opportunities to improve human institutions, human relations between nations, and the human systems that govern our precious Earth. They feel a sense of duty to use their wealth, power, and talents to reduce the suffering that afflicts billions of people around the world today. From charity work to public policy advocacy, Guardian Angels achieve a kind of immortality by leaving an enduring legacy far beyond their lifetimes. This is the estimated cash rewards per year that you would receive if your Member Network performs according to the estimates you provided above. This is the rate that corresponds to the highest level that you have achieved in the AngelPay Rewards Program. This is the average Rewards rate that you have achieved in the AngelPay Rewards Program. It is an “average” because the Rewards Program is based on a marginal rate payout system, which means Affiliates are paid at multiple levels depending on which level they have reached in the program. See the Rewards Program FAQ to learn more. 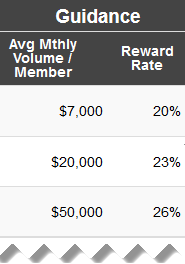 This is the estimated cash rewards per month that you would receive if your Member Network performs according to the estimates you provided above. Affiliates should always be aware of the estimated monthly payment processing needs of their prospective Members to ensure that they understand what their prospective Members actually need. With this awareness, Affiliates can determine whether the prospective Member is processing enough monthly volume to justify the time and energy required to explain how the nonprofit AngelPay Foundation can help them significantly reduce their monthly payment processing costs. Hidden fees, high fees, poor responsiveness, technological lock-in, cryptic terminology, deceptive marketing and communications, unreliable processing tools–these are just a few of the pain points that have driven many merchants away from for-profit payment processors and into the much friendlier environment of the AngelPay Community. These issues can be quite traumatic. Are any of these pain points adversely affecting your organization, your personal health, or your emotional well-being? 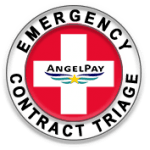 If your existing merchant payment services provider does not seem to really care about your organization’s best interests, please don’t hesitate to contact us to see if AngelPay’s Emergency Contract Triage Program can help eliminate or reduce the pain.